1. Cover and microwave rice and water on high for 10 minutes, then medium 10 minutes. 2. Heat oil in fry pan or wok. 4. Stir in curry paste and curry powder to evenly coat chicken. 5. Add enough water to cover and bring to a boil. 6. Reduce heat, cover frying pan and simmer until chicken is no longer pink. 7. 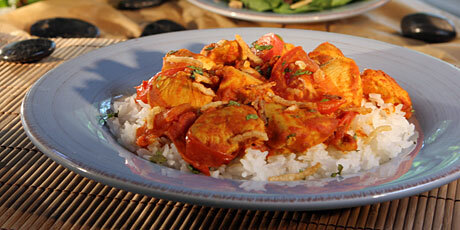 Stir the coconut milk, tomato puree, fish sauce, palm sugar, and 1/2 the tomato wedges into the frying pan. 8. Cook and stir over low heat until the mixture is smooth and creamy. 9. Mix in the remaining tomatoes, and continue cooking until tender. 10. Rinse cilantro and set aside in a tall glass or bowl. 11. Put salad directly into salad spinner. Rinse and spin dry. Serve with dressing of choice. 12. Serve curry over rice. 13. Each person can top with cilantro and the fried shallots to their liking.